The National Council for Arts and Culture (NCAC) was established by Decree No. 3 of 1975 and amended by Decree No. 5 of 1987 (now Cap N25 Laws of the Federation 2004). It is a Federal Government organ charged, with the responsibility of coordination, development and promotion of the Living Arts and Culture of Nigeria at national and international fora. Over the years, our efforts have been to coordinate, preserve, promote and present the best of our Crafts, Textiles, Cuisines, Traditional Dance, Drama, Opera, Cinema, Film, Photography, Folklore, Oral Traditions, Literature, Traditional games, Indigenous architecture and to deploy them as tool for forging national unity and identity. Similarly, our cultural manifestations which are unique and diverse shall be at the front burner in our quest to tap into the unique resources that abound in the culture industry. 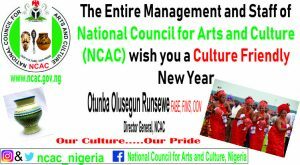 Once more, welcome to the National Council For Arts and Culture (NCAC) website. We hope you will find the contents interesting. Born in Kaduna to the family of Pa Bankole Runsewe from Ogun State, Otunba Olusegun Runsewe attended St. Michael Primary School, Kaduna before proceeding to Vohoeven Technical College Minna, now Government Technical College. He holds an MBA in Marketing from Edo State University; Higher National Diploma in Management Studies from London School for Executives. He also has a Diploma in Public Relations from the London School of Management Studies and a Professional Certificate in Estate and Property Management from Kaduna Polytechnic. 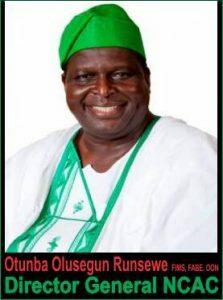 Otunba Runsewe has remained a consistent phenomenon in the Media, Culture and Tourism Sectors in Nigeria since the last three decades. He worked as Marketing Manager at the New Nigerian Newspaper and rose to the position of General Manager at the organization. Read More…….